I’m delighted to say that this post is sponsored by Suncoast Gold, who I love for their super creamy, dreamy, macadamia milk. This milk is so flavourful and makes for a lovely treat in my morning coffee. Tastes like dessert! 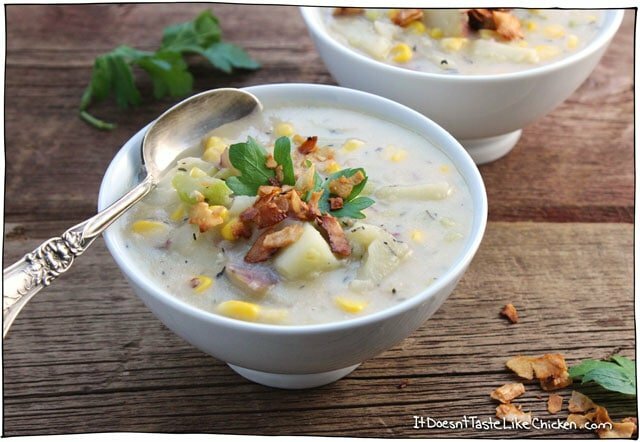 Why hello hearty, creamy, chowda! How are you today? One of the best things about winter is the excuse to make soup. Always soup. More soup. Need soup. 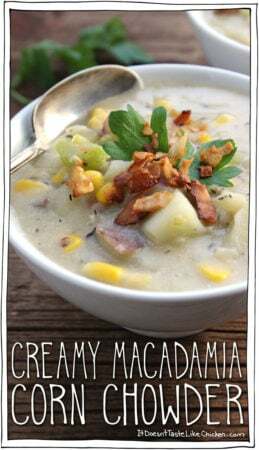 My go-to’s are my Creamy Vegan Potato Soup, Quick Vegan Pho, Congee, and now this insanely rich and satisfying Creamy Macadamia Corn Chowder. Soups are one of my favourite ways to smash in a big pile of veggies, while simultaneously warming you from the inside out. It’s where comfort food and health food meet, shake hands, give each other a big warm hug, then decide to hang out and be awesome best buds. (You just pictured cartoon health foods hanging out, didn’t you)? 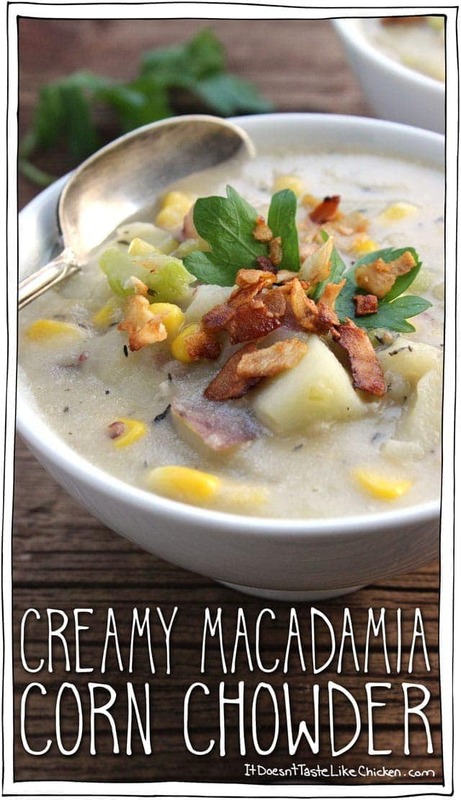 This Creamy Macadamia Corn Chowder is so very yummy! The macadamia flavour is really present with it’s creamy deliciousness, then there’s the satisfying bites of potato, and the sweet pops of corn. Sprinkle that with some Coconut Bacon, and my taste buds are singing! So what’s all the hubbub about this macadamia milk? One of the best things about being dairy free is it’s like suddenly the world of milk options open up to you, and now instead of just cows milk, you have a gazillion choices. Everything from soy milk, almond milk, hemp milk, oat milk, rice milk, cashew milk, coconut milk, the list goes on! New on the market is Suncoast Gold Macadamia Delight. Macadamia nuts are so scrumptious! I love the rich creaminess of macadamias and use them to make a Macadamia Ricotta, so it wasn’t surprising to me that I loved this milk. It really tastes like dessert (especially the original flavour), but lucky for us it has all the goodness of macadamia nuts including good for you fats, high in potassium and zinc. So let’s get this party started, it’s chowda time! 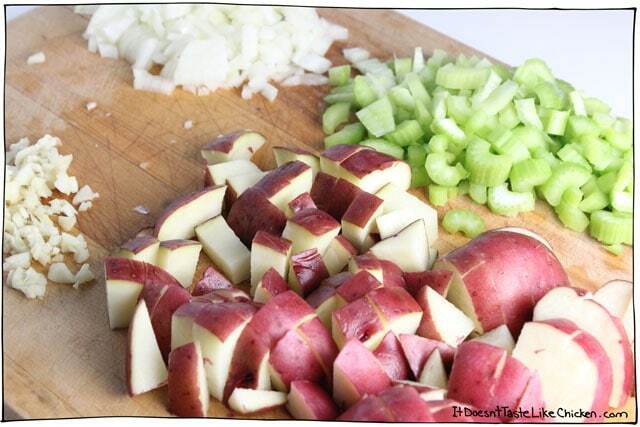 Chop the onion, celery, and potatoes into small cubes, and mince the garlic. I like to leave the skin on the potatoes, but if you prefer you can peel it off. I used red potatoes here but yukon golds, or white potatoes would work just fine too. In a large soup pot heat the olive oil over medium heat. Add the onion and celery and sauté until the onions become translucent and are just beginning to brown. Add in the garlic and thyme and cook for a minute more. It should be smelling pretty delish right about now. Yummy! Stir in the flour, then add in the Suncoast Gold Macadamia Milk, potatoes, salt and pepper. Bring to a simmer and cook for about 10 to 15 minutes until the potatoes are fork tender. It’s getting steamy in here! Use an immersion blender to blend about 1/3 of the soup. 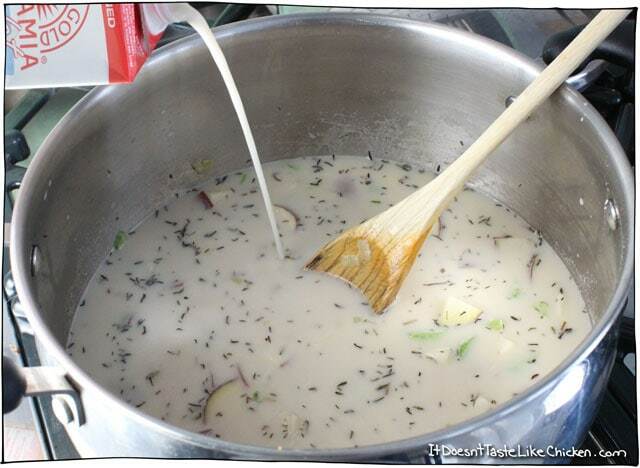 This makes the soup very creamy and thick, but still leaves lots of texture. Yum! If you have a standing blender, just scoop about 1/3 of the soup into the blender, blend, pour it back in and stir to combine. Be careful not to fill your blender too much, so you don’t have a hot soup explosion! Finally add in the corn and cook until it’s heated through, about 5 more minutes. Serve hot with garnishes of choice such as coconut bacon, parsley, chives, vegan cheddar shreds, or just a few cracks of fresh pepper. Such an easy, creamy, rich, hearty and healthy soup. Perfect to warm you up this winter! 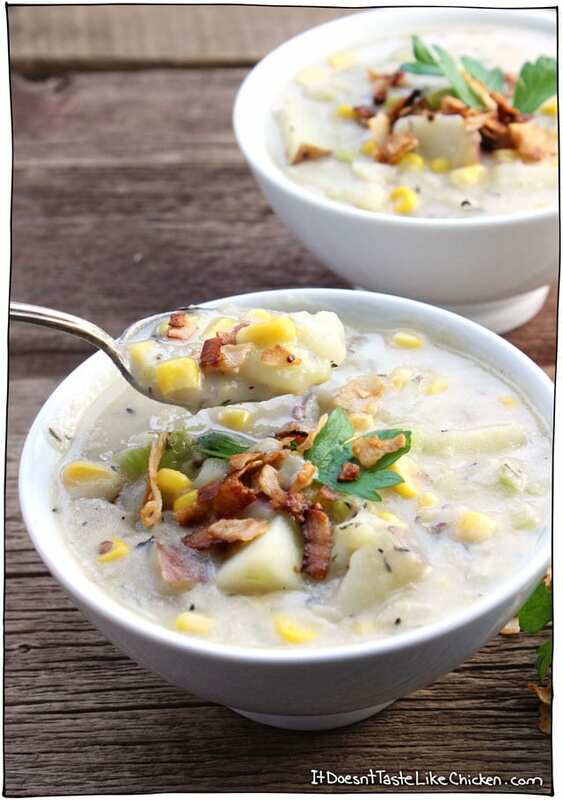 Vegan and dairy free chowder takes just 30 minutes to make from start to finish. In a large soup pot heat the olive oil over medium heat. 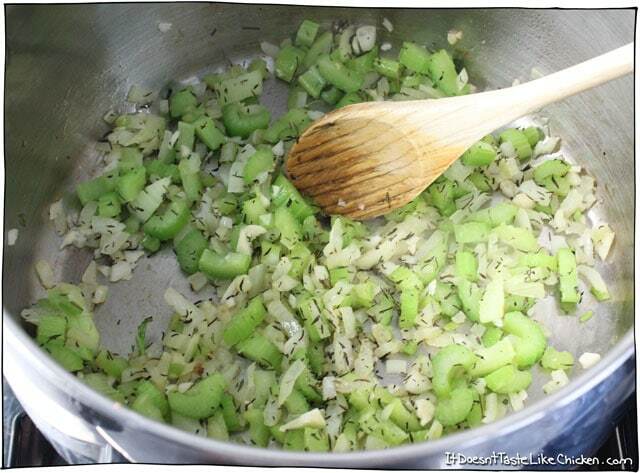 Add the onion and celery and sauté until the onions become translucent and are just beginning to brown. Add in the garlic and thyme and cook for a minute more. Stir in the flour, then add in the Suncoast Macadamia milk, potatoes, salt and pepper. Bring to a simmer and cook for about 10 to 15 minutes until the potatoes are fork tender. Use a immersion blender to blend about 1/3 of the soup. 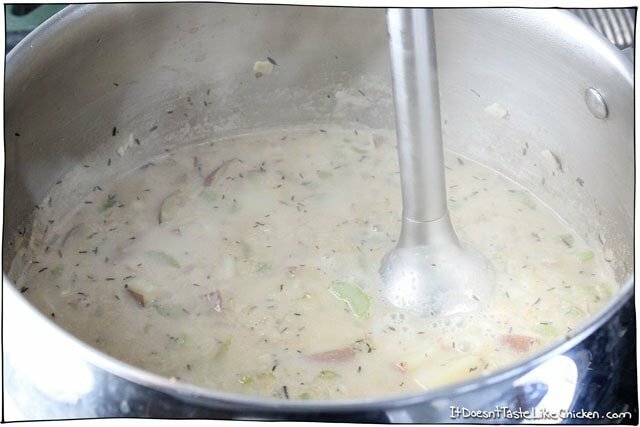 This makes the soup very creamy and thick, but still leaves lots of texture. Yum! If you have a standing blender, just scoop about 1/3 of the soup into the blender, blend, pour it back in and stir to combine. Finally add in the corn and cook until it's heated through, about 5 more minutes. Serve hot with garnishes of choice such as coconut bacon, parsley, chives, or vegan cheddar shreds. I used red potatoes here but yukon golds, or white potatoes would work just fine too. If you prefer you can peel off the skin. I’ve scarfed down Two batches of this delicious blend. Unfortunately there is no Mac Nut milk available locally. First batch was Almond-Coconut blend by Almond Breeze. Not thick and rich enough. Second batch I used a can of Thai Kitchen Coconut Milk and one and half cups of Almond-coconut blend. Just right. Then I punched it up with some Old Bay seasoning and it’s a winner. 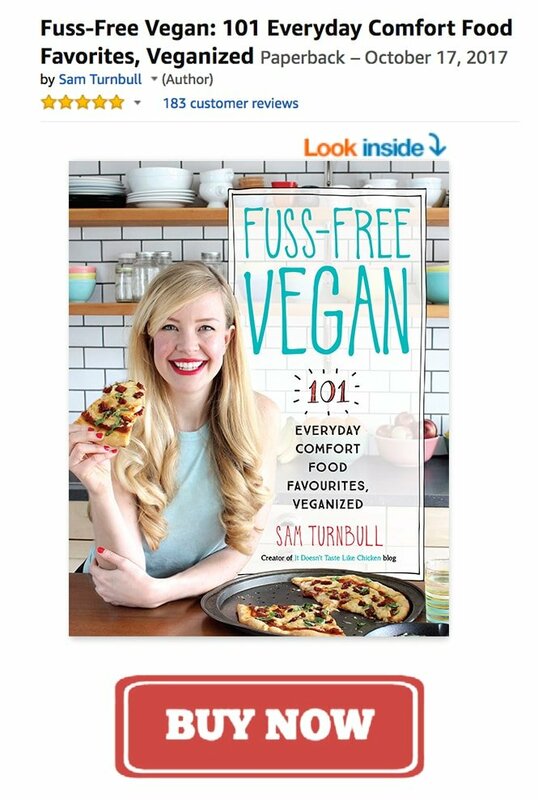 Hi Sam… I want to make this, but not sure if the Macadamia milk is available yet where I live. Any suggestions for alternatives? Just any unsweetened nut milk? Thanks! Hi Srivani! Yep, I think any unsweetened non-dairy milk would work great. I would opt for a creamier one such as soy or coconut milk (the kind in a carton), to keep that richness. Enjoy! Made this for dinner. Super easy (I LOVE super easy!) and incredibly tasty (I love that even more!). 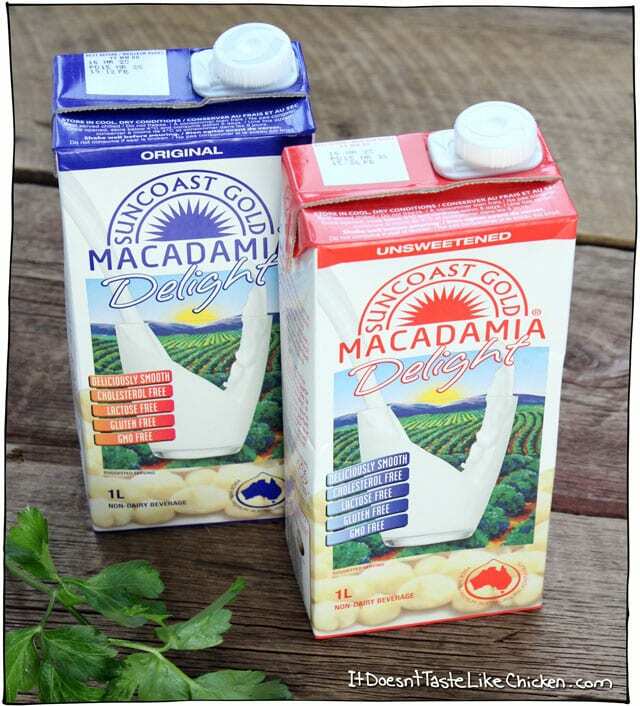 I was able to find the macadamia milk – that stuff is creamy yummy. Also made the Cocconut Bacon. WOW! That stuff is awesome… snacking on it now as I type. Once again, Sam, you rock! Okay YUM! This looks unbelievably creamy and delicious. 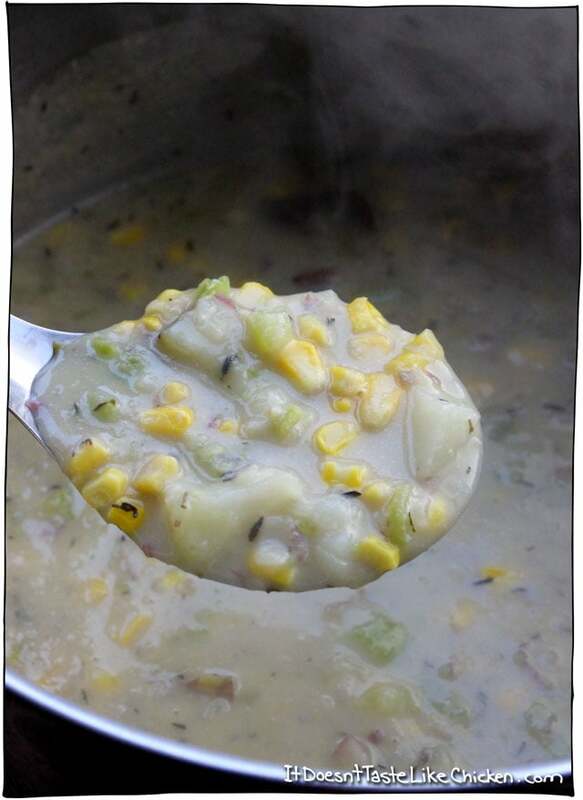 We love our corn bisque in the south, but this looks like the perfect vegan alternative! !